In its continued effort to take virtual reality mainstream, Facebook has announced Oculus Go - a standalone headset that will be released in 2018. "If VR doesn't go mass market at this price point, I think we can conclude that it never will,” said John Delaney, an analyst with IDC. The existing budget way to get Facebook's VR is the Samsung Gear VR at $129 - but that requires a high-end Samsung smartphone in order to work. To get there, the company needs to create a premium, standalone VR device that offers free movement. It hasn’t managed that yet - the new Oculus Go should still be regarded as a budget VR experience. But the company’s new head of VR, Hugo Barra, also shared more details about Project Santa Cruz, Facebook’s prototype high-end device that will offer movement-tracking without the need for tethering to a computer, or the placing of sensors around a home. Many had hoped Project Santa Cruz would get a public release date, having first been announced at this event last year. Facebook’s new head of VR, Hugo Barra, would only divulge that developers would be sent devices to work with within the next 12 months. Until then, Oculus Go is Facebook’s biggest hope in stepping up the adoption of virtual reality among the general public. The device will be sent to developers to start building with in November this year. It will offer better visuals than the current Gear VR, but drops well short of the premium VR experience offered by the Oculus Rift and Touch controllers. Throughout 2017, Mr Zuckerberg - who has repeatedly said he’s not considering a run for president - has travelled the US, meeting regular Americans. "I think one of the problems with VR as a mass-market proposition is that you're unaware of what's happening around you in reality,” said analyst Mr Delaney. Some believe the missing link in making virtual reality popular with this masses is content. In other words, even with the hardware getting cheaper, there’s too few fun experiences to be had. “Oculus Go is an important step to broaden the audience for VR,” remarked Geoff Blaber from CCS Insight. Facebook pointed to several successes, including three Emmy awards won by VR titles this year. Big Hollywood tie-ups, with studios like Marvel, will look to build on this - but it will take time. A newly-announced tie-up with games developer Respawn, creator of Titanfall, will bring a major new title, but not until at least 2019. Another strategy for getting Oculus Rift in the hands of more people is to make it part of the world of work. 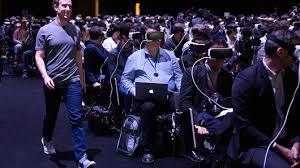 Facebook launched Oculus for Business, a scheme that will offer firms dedicated support and hardware bundle deals. The company would help firms put VR into their workflows, Mr Barra said. Over the past three decades, promises of virtual reality have come in waves. This latest effort shows the most promise, by far - but the unavoidable detail is that the hardware still remains too cumbersome for the mass market. Premium VR is too big and too expensive. "Nothing is going to replace being with someone in person. But when we run up against the limits of reality, VR is going to make our reality that much better."